Just found StorURL through the Major Geeks website and so far I’m loving it. There is one feature I’d like to see added though that I’m wondering if you’d consider in a future version. I use different browsers for different purposes. For instance, I’ve found Microsoft Edge seems to give the best performance for streaming video on my system. For online banking, shopping, etc I prefer to use Chrome. What I’d like to see is the ability to set each individual bookmark to a specific browser without having to right click the link and selecting the browser from a list. Say I’m opening Comet TV, I’d like to be able to tell StorURL to always open Comet in Edge. If I’m opening my bank’s website I’d like to be able to tell StorURL to always open that page in Chrome. Other than that one shortcoming I think the software is fantastic! Thanks for the work you’ve put into it! This sounds like a great idea! I will add it to the wish list of features. Thank you for the suggestion. A few ideas to improve storeurl. Imo this is a great program, but also i believe it could be more useful if it could be linked to firefox, chrome, etc, through an addon in a similar fashion to how “uget integrator” connects with uget to allow it to manage the links. that way, rather than relying in each bookmark manager from each browser (and their own sync accounts, or an external service), all bookmars could be managed with storurl to easily browse them. the extension or addon could allow a new “star button” and a right click option to send a link to storurl (which could be the portable version, allowing users to choose if sync with storurl online, or by placing the program or only the db in a cloud sync service like dropbox, allowing different versions to search for the same sync-db). Another thing that would be great to automate could be filling the description of a link with the first 3 lines in the first paragraph of the actual content of the page, or the description included in metatags. 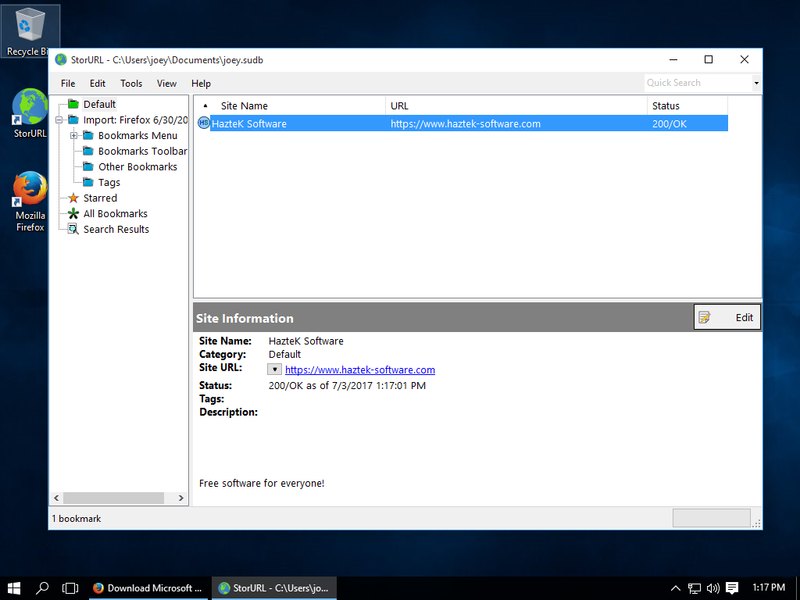 A linux version made with appimage could work a bit like the portable version in windows. I hope this project keeps evolving. Thank you for the suggestions. If you are a developer of browser extensions, and would like to integrate with StorURL, please feel free to do so. StorURL uses a very basic SQLite3 database format, which was detailed in a comment in February 2018 on this same page. I personally have no desire to develop browser extensions and prefer to have standalone applications on my desktop, so it’s not likely that you will see integration in that manner with any browser. As for filling the description, while it’s a good idea, it’s a bit tough to implement. Web sites don’t really follow any set rules to define the “first” paragraph of the page. I could guess on the page, and hope that the first <p> tag was what you wanted, but there may not be a tag matching that at all, or it could be used for some other reason than actual paragraph data. It would get messy really quickly. StorURL does, however, attempt to retrieve the description from the meta tags. I’ve noticed that fewer and fewer websites actually include data in that field though, since search engines like Google started ignoring that information, so people don’t use it to game the algorithm. StorURL also pulls the keywords meta tag for easier searching in the future. I just downloaded your online and desktop versions. Is there a way of importing my bookmarks into the online version, or synching it after importing my bookmarks into the desktop version? I primarily want to use the online version of this tool. Hey, I love the software I was wondering if you could add support (if possible) for dragging links from Slimjet (which is a browser based on Chromium) into the main bookmarking window in any case great software. Hello! I just tested with Slimjet, and it looks like it works the same as Chrome or Firefox. I was able to drag links from Slimjet into StorURL just fine. Hi. I recently installed storurl on my win 10 x64 bit system and it worked fine for a few days before it would immediate;y shut down after loaing. Uninstalling then reinstalling would not resolve the issue. After again uninstalling then reinstalling after a the April Win 10 update the issue sti;; remains. IT begins to load and update the database then shuts down. Any ideas? Hi, recently found your storurl program on OlderGeeks.com (great site btw), and was really excited as finding a good browser independent bookmark manager is something I have been searching for for quite a while. A couple things though I have found counter intuitive or even a bit of a road block, hoping you may have some suggestions. 1. I like the floating toolbar, but maybe plugins for chrome or firefox would be great also, at least if they could talk to the same database. Not a big deal, but maybe could somehow make my second question get solved also..
2. An easier way to sync the web version with the desktop and vice versa! It looks like you can directly import from the web to the application, but the web only supports importing json? Would be nice to sync both ways, as I am constantly moving from my laptop to my home system, and would like them to be synced. Thought of using portable mode along with google drive, etc, but then also would be nice if Im on another system or my phone and could easily bring up my info on the web page! Again, really like the program and maybe being a little nit picky lol, but I feel like you have all the pieces there to make this happen easily? P.S. I know i could just use the web exclusively, but then I always need to make sure I have a web page with my page open, thats where I thought maybe a plugin could be a way to make that easier. Thanks for your time and the great software! first of all thanks for a usefull little tool that I have found quite usefull for a lot of my issues with shared browser bookmarks. I do use several browsers installed in different places in different ways for indeed quite different things and also do supply subsets of bookmarks for others to use for certain jobs they might get assigned to do. Some of these links are rather not meant for public and therefor a central online solution would be somewhat of a security risk. While Transmute is indeed usefull for some issues I have found storurl usefull for other things that transmute doesn’t cover in the way I like to do things. The issue I’m having at the moment is that if a normal installation of IE is present on the host system then the import menu will default to that. Up to now, when wanting to import bookmarks found in the IE style we simply dropped them into the default folder and deleted them afterwards. So I was wondering whether it would be possible to add a screen when importing from IE where I could opt out of the default location and instead point StorUrl to some other folder of my choice and force it to ignore the default places. btw any chance of supporting plugins others might want to add? Like exporting to other styles or supporting exotic or inhouse bookmark formats. anyways, many thanks for a really usefull tool so far. Thank you for your suggestions. I agree that there should be a way to specify where to import for IE bookmarks, just like all of the other browsers that StorURL supports. I will add it to my list of feature requests. When you say that import/export of subsets could be easier, what would you like to see? Would the ability to just make a selection of bookmarks, right-click and export only the selected ones to one of the formats StorURL supports (currently CSV and XML) be useful? Or are you referring to something else? I still have no plans to allow export to other browser formats. There is just too much risk for corrupting external applications when writing to their formats, and I definitely don’t want to be the guy who released some software that accidentally destroyed someone’s decade-old bookmark collection. 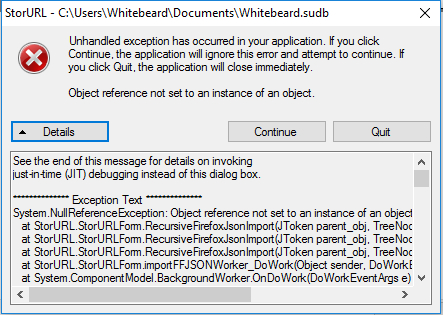 Were you passing any parameters to the application, or did you just click the shortcut or executable directly? This sounds like a strange error trying to load a file, but you shouldn’t need to load any files when starting StorURL. If possible, please send a screenshot of the error dialog to support@haztek-software.com and I’ll see if I can figure out what is going on. Additionally, if I am reading that error message correctly, it looks like you are running an old version of StorURL. Please update to the latest version (3.0.19.0 as of the time of this comment) to see if it resolves your issue. I installed MS VC++ 2005 x86 version and everything is working fine. Thanks a lot, it’s really an excellent software. I wish you include the above mentioned file in your next version. Am using and loving the portable version. Thank you! Feature suggestions: 1) Add checkbox to search folder names, 2) include folder name matches in the regular search results. Hi Prometheus and thank you for the suggestions. I’ve added them to my list of feature requests, and may implement in a new version in the future. It is possible that I did not fully understand all the subtleties of this software, I am just starting to use it. But I thought to find the way with this software to sort and clean my list of bookmarks and then reintroduce it in my browser. But, unless I’m mistaken, I did not find a function to re-register my bookmark list as a “place.sqlite” file? (i use Firefox). Did I miss something? Anyway, this software is really very good. You are not missing anything. StorURL is not a bookmark cleaning solution. It was designed to be one central repository for all of your bookmarks instead of having them distributed among many different browsers. At this point in time, there are no plans to implement a method for exporting bookmarks back out to any single individual browser. If you are looking for a way to copy bookmarks from one browser to another, you might want to look at an application called Transmute: http://www.gettransmute.com/ which seems to do the job. Hello, thanks for your great soft. Just to make sure – that is delimiter for tags? I’m not 100% sure what you are asking. The tags field in StorURL is just a list of words concatenated with comma characters. It currently does not support sorting or grouping by tags, it just makes it easier to search your bookmarks for a specific tag. This is exactly that i need to now. Maybe good idea mention this in help file. Please include releasing dates in changelog! And add a home or back button on changelog page. I want to thank you very much for the great tools (especially this one) you have developed and made them available for free. I’m really enjoying StorURL, it has lot’s of potentials to be the best among it’s other free and even paid rivals. I’m just hoping you wouldn’t stop developing this anytime soon. However it is lacking deduplicating, and I think it’s one of the top features any bookmark manager should have. I’m really awaiting an update with this feature. About importing bookmarks, I’m using Opera Beta browser and the Opera’s bookmark importing feature just looks for Opera Stable’s profile directory at “%USERPROFILE\AppData\Roaming\Opera Software\Opera Stable”. It would be great for it to look at “~\Opera Software\Opera Next” and “~\Opera Software\Opera Developer” in addition, to find the Opera Beta and Developer Bookmark file too. And last of all, having some control over font sizes would be great. But not much important! Thank you for the suggestions. Deduplication is on the road map, but I haven’t had the time to implement it. For the Opera bookmark importation, you should be able to navigate to the location of your bookmarks wherever they are. By default I set the browse window to the standard Opera directory, since that will be what most users would expect. As long as the bookmark file format is the same across all of the different browsers you specified, they should import without any issues. As for the font size request, I will add it to the feature wish list. Your welcome and thank you for replying. I can import the bookmarks from Opera Next manually. But as there is no browser extension for StorURL to automatically sync with the browser, or a 1click button in the program to read the bookmark file again, I just wanted to reduce the needed time for updating my bookmarks in the program and getting any new ones. As I do this frequently. Thanks for accepting font size customization feature. I hope you get some free time soon to implement deduplication too. I really wished I could donate to you, but unfortunately Iran is under prohibition by USA and we can’t have PayPal or any other similar internatinal financial accounts legally. Therefore I’m trying to give back a little to your efforts in another way, and I have already something in mind to extend StorURL. Great free tool, and many thanks for it! Hi dB, what do you mean by clickable listing of tags? I’m kind of confused by the request. I like it, but the ability to re-arrange the folders would be good. I have folders that I would like to be seated under each other as they are related, but I can’t seem to move /re-arrange them. Jon, you should be able to move folders into other folders with out issue. StorURL currently does not allow you to manually sort items at the same level. If you want a folder that is related to another folder, they should either both go into a shared parent category, or just put one inside the other one. Thank you for this great program. I still have the original version which is working fine. In case I want to upgrade and also for backup purposes can you tell me where is the database located, or is it within the program itself? With the original StorURL 1.0-2.49 versions, the database is stored in the application’s directory. There will be a separate text based file for each category. If you point the latest version at the install path for StorURL 1.0 using the built-in import functionality, it should bring your database into the modern era. Click File->Import->StorURL Database->Version 1.0-2.49. In the dialog that pops up, select the C:\Program Files\StorURL directory (assuming that’s where you installed it). Heya! Thanks for the great program. In a recent version, importing Firefox Bookmarks now also includes descriptions which is great. I have a lot of bookmarks with descriptions but I also have a lot of ones that are blank and I would like to keep them all blank. However. when importing the bookmarks, most (not all, probably a bug) of the blank descriptions get automatically populated with “Imported from Firefox”. I feel this is redundant and unnecessary since the category already says where its imported from. It just makes a fairly large collection of bookmarks descriptions cluttered and maybe increases database size too. So yeah, that’s my one suggestion. Keep Imported bookmarks descriptions that are blank from being populated with “imported From Firefox”. What is nothing should stay nothing. Thanks for the feedback Zero. I will look into this for a future version. Thank you for the floating bar hotkey ! However it only works when the Storurl window is active. Could you please try to make it work frow anywhere (ie even when storurl is in the system tray) ? Importing bookmarks from a Firefox .json backup file doesn’t work for me. I tried both the portable and installer version. I have Microsoft .NET 3.5 Framework and Microsoft Visual C++ 2005 Service Pack 1 Redistributable Package MFC Security Update. I also tried running StorURL as Admin. Importing bookmarks from a Firefox Places file works as advertised so it’s not that important to me but I thought reporting this might be a good idea. Maybe the problem is on my side. Thank you for the program! I found that the imported bookmarks in folders are arranged in descending order from A to Z. This is very inconvenient, because the bookmarks were in logical order, and not in letters. Is it possible to hope that the next updates will implement the ability to undo the hard alphabetical order? I understand your frustration with the method in which StorURL orders the bookmarks after importation. StorURL currently does not store order state, as that gets really messy to keep track of within the database. I will add it to the list of “wants,” but at this point in time I don’t have an immediate plan to implement this feature. I have a difficulty to use the application: HOW to import Google Chrome bookmarks ? (non html) please ? Hi developers, I have founde where were the bookmark file of ggchrome, in fact it is not in the ‘default’ folder, but in the ‘ profile1 ‘ folder…lol ! Anyway I think I am good to continue to test your app, excuse me for my coms. Thanks for finding that. It may be helpful to other users in the future. StorURL doesn’t know which profile you want to import from for Chrome, so it picks the “default” folder, as that’s the most common place for a user to have their Chrome bookmarks stored. With Firefox, it will be similar. If there is more than one profile in Firefox, it will not know which one you want to import from, and may make a wrong decision. Feature suggestion: duplicate bookmarks finder (and cleaner). I’ve got Firefox on my PC and on my laptop. There’s a huge intersection of bookmarks between the two so it would be cool if StorURL could locate and delete the duplicates. I’ll import the .json bookmark backup from my laptop Firefox into my PC Firefox and use an Firefox add-on to clean my bookmark collection and after that, I’ll import my bookmarks into StorURL but I think it would be useful to have this feature in StorURL. Thanks for the suggestion AltairAC. Duplicated bookmark search/removal is on the roadmap, but I haven’t come up with a good, efficient way to do it that doesn’t confuse the user. There is also too much stuff inside. Your software is simple, clean and easy. – it’s not unicode compliant. All my french, italian, russian, german links are unreadable. Letters as éèùìò are replaced with symbols. I noted also that the search is not very fast if there are many url’s. Sorry it is unicode compliant. I don’t what happened when I tried to import a html file. I really liked your program but how to import bookmarks from HTML file? Thank you, I did so “import the HTML file into another browser…and then import into StorURL from that browser”. Hello. I have a few features I’d like to suggest. – Support for tagging and import of tags from Firefox Bookmarks. Nice app, simple & intuitive. – After a while, adding ‘New Category’ with contextmenu is no more available (grayed out). I have to click to File -> New to add another one.. Thanks for the feedback ene! I’ll take your feature suggestions into consideration. I’ve identified and resolved the New Category being greyed out bug. It should be fixed in the next release. I’m not sure what specific issue you are hitting when Site icons are greyed out. That option should be disabled if there are no bookmarks in the currently selected category, and should be re-enabled as soon as you navigate to a category that does contain bookmarks. I’ve just tried the icons stuff out and it works fine ! PS: you need to restart the app in order to see them. Just another idea which might come in handy when you have lot of categories, the ability to add custom icons to them to make your content a bit easier to read. Thanks again and good luck with your next updates ! I downloaded your program and installed it with no apparent errors but am at a lost on how it works. How come there is no help file? I don’t understand how it works. Can you please get me started. Please check out our video tutorial page for details on how to get started. The very first video should get you going. There is definitely a help file included with the application, but you have to launch the application to get access to it via the help menu. First, let me tell you i’m so glad to find this app.! I was searching for a good bookmak manager since a while. And finaly i find this one, and it’s free. Once again : thank you for this app. Hello! Thanks for the positive comments. I’m glad you are happy with StorURL. 1. StorURL uses native OS calls to launch the browser, it doesn’t specifically know how to interact with any single browser, as it was designed to work equally with all browsers. In my specific test case, if Firefox is not open, and I click the link in StorURL, it automatically opens the browser. If Firefox is already open, it already opens a new tab. I am not sure if this is a configuration in Firefox that I have specifically defined, or if that is the default behavior, but it seems to already be doing what you are asking for. As for your additional idea, I will look into why specifying parameters for custom browsers does not work. It is supposed to allow you to do what you are suggesting already, and I have tested that exact use-case in the past so I know it used to work. There seems to be a bug introduced. I will try to squash it. 2. You can just select multiple URLs in a category, right-click any one of them, and choose Open in Browser->Your Browser. It will automatically open each of the URLs in a separate tab in the browser, or separate windows if you have your browser configured that way. 3. StorURL conforms to the system’s theme colors. If you set it to one of the accessible themes that use dark backgrounds, it will render itself with that theme instead of the bright white defaults. Nevertheless, I’ll consider implementing a way to customize the window. 4. Password protection/encryption is on the roadmap for the next major release. I haven’t had much time to work on major changes lately, but once I get some free time, it’s definitely going to be implemented. Thanks for the suggestions, they are definitely helpful in making StorURL a useful tool for all who want it. I’m glad i could bring some ideas. – With Internet Explorer : when i try to open multiple URLs like you said it opens each URL in a separate window. – With Firefox already open : I have this message if I try to open 1 or 2 URLs : ” Another Mozilla Firefox is running. Close Mozilla Firefox before running Mozilla Firefox Portable”. I don’t know, perhaps the problem depends on my computer. I use Firefox but Internet Explorer is my default browser. Anyway, I’m waiting for the next major release. Thank you for taking time to considered my suggestions. Thank you for updating StorURL! If it’s as good as the previous version, I’m excited! (smile).. I’m little concerned, saw the earlier post above and I also use WIN7 PRO. Will the StorURL new version also stop on me as it did for this other person? I also enjoy two other utilities: the Multi-File Replace and the Work Scheduler. SUGGESTION: please make both the Multi-Replace and the Work Scheduler portable/USB? Also, if you’re interested in receiving email updates when StorURL gets updated, fill out the little subscription box above. It will sign you up only to receive updates for this specific application, when I post them. I won’t use your address for any other purpose than to notify you when StorURL is updated. 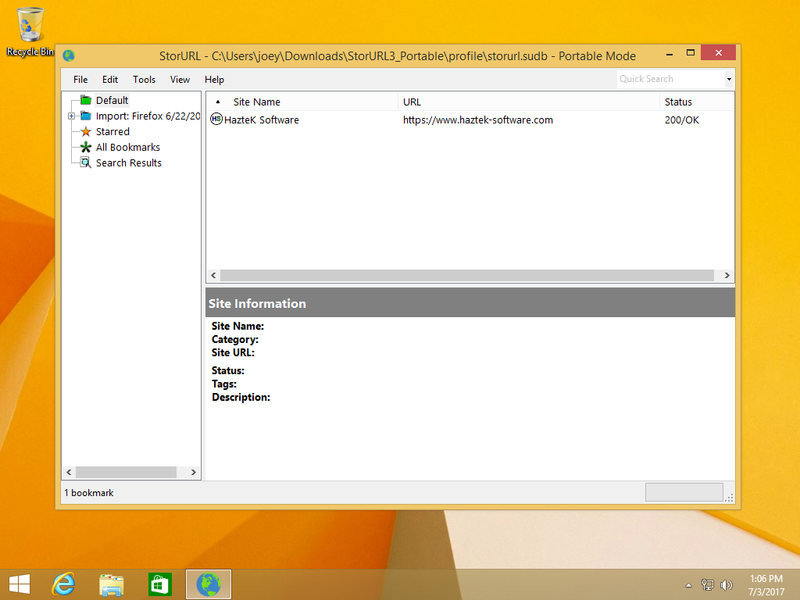 I’m unable to install storURL 3.0 on win7. It stops at the creating database stage. I checked event log and found 2 events logged with storURL: ID 33 and 1001. I read your introduction again and enabled .NET 3.5 framework (initially only .NET 4 is running). But still same issue. I have sent you an email with some troubleshooting steps that I felt weren’t really helpful to post as a comment. Please try those steps and let me know how it goes. I have gotten your mail, tried the steps, and had sent you the error message. Hope those are useful. We resolved this issue by having Jo install the Microsoft Visual C++ 2005 Runtime files, which are necessary for the new database format. If you run into an issue while trying to load or create a database, please make sure you have these runtime files installed.